Amasty launched a highly anticipated tool – the Magento 2 Multi Warehouse Inventory extension. This inventory module will help you easily split inventory among several warehouses. 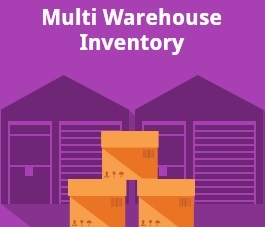 Besides, the Magento 2 multi warehouse inventory tool provides the ability to control stock items on different levels. Advanced inventory management also includes the ability to work with each separate warehouse on one handy grid. Below, we describe the Amasty Multi Warehouse Inventory Magento 2 extension in more details. Besides, we compare it with other similar tools here: Magento 2 multi warehouse extensions comparison. Why is the Magento 2 multi warehouse inventory extension so important? Because it is impossible to work with several warehouses in Magento 2 by default. The desired functionality is only possible via third-party modules, and Amasty Multi Warehouse Inventory for Magento 2 is among the most reliable solutions. Vendors With Multiple Warehouses. The Magento 2 multi warehouse inventory extension allows splitting inventory among different warehouses. You can use any of them depending on such parameters as a priority, location, and others. Warehouses can be associated with specific stores. Multilingual Stores. Warehouses can be assigned to store views with different languages so that local administrators will manage inventory more efficiently. Stores With Several Administrators. Each warehouse can be assigned to a specific customer group, helping admins increase the efficiency of stock management. It is almost impossible to sell internationally having only one warehouse in your native country. Therefore, large merchants always have multiple warehouses even if they work within one country. 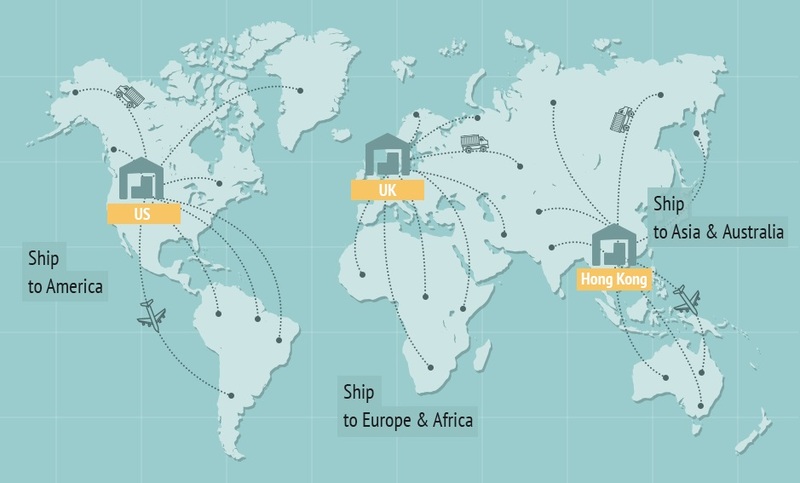 Having a warehouse in each region helps to increase the delivery speed and decrease its costs. Advanced Inventory Management: unlimited warehouses; custom stock locations; offline shops inventory tracking; virtual warehouse for defective products; dropshipping. Advanced Warehouse Management: assign warehouses to customer groups; assign warehouses to store views. Orders From Different Warehouses: divide an order into several shipments and calculate costs separately on the basis of each warehouse location. Stock Control: updates per warehouse from Manage Stock grid or backend product pages. Three Stock Levels: Physical Qty, Qty to Ship, Available Qty (for sale). Backorders: enable backorder functionality for specific warehouses. Warehouse Priority: select from which warehouse an order will be shipped based on product availability. Smart Warehouse Selection: the fully customizable algorithm is based on the warehouse priority, location, store view (where an order was placed), or assigned customer group. Custom shipping methods and rates per a warehouse: specify your custom rates different from those calculated by a shipping company. Low Stock Reports: custom stock value to send a report. Returned Items: returned goods are automatically added to the corresponding warehouse. Magento SOAP API and REST API support: add stock data by product ID/SKU; retrieve stocks by ID/SKU; get products by warehouse code/ID. The Manage Warehouses grid of the Magento 2 multi warehouse inventory extension allows you to view such data as a warehouse ID, title, the total number of SKUs, total qty, available qty, qty to ship, contact data like email, phone, city, and country, as well as store views and customer groups. 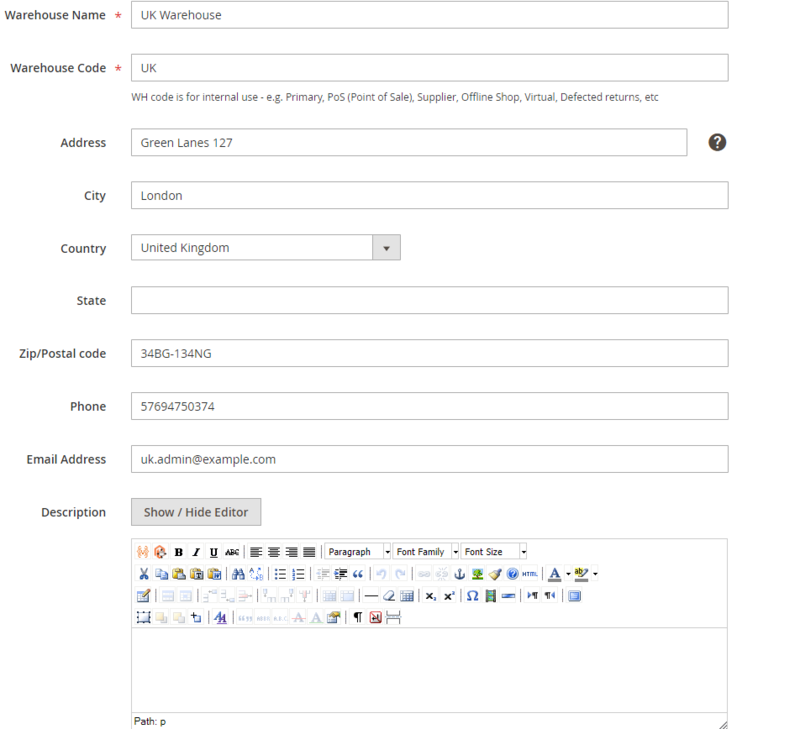 While creating a new warehouse, specify its name, code, contact information, and description. Next, the Magento 2 multi warehouse inventory extension offers the Settings section. 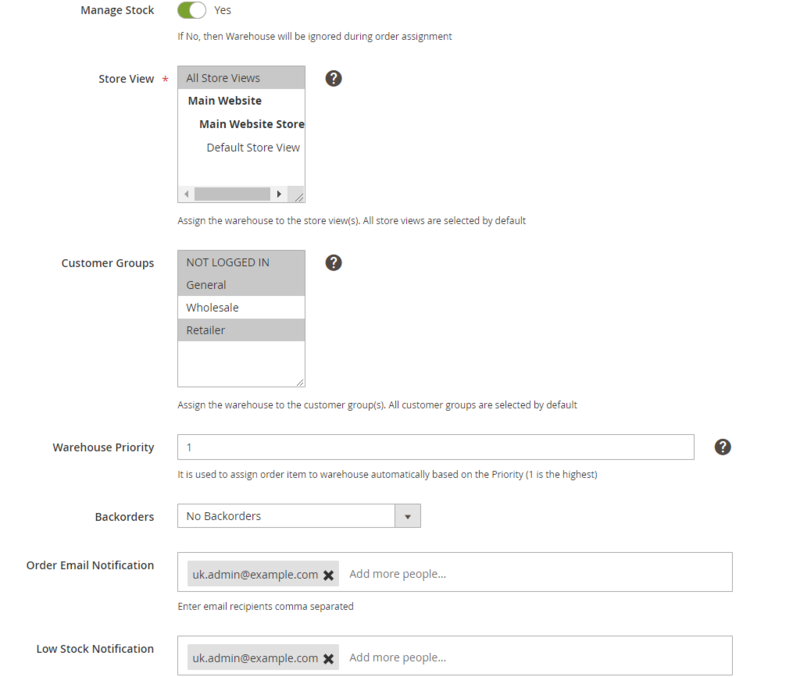 Here, you can enable/disable stock management, assign a store view and customer groups, set the warehouse priority, allow backorders, and specify recipients of order email and low stock notifications. Note that in case a customer adds products from different warehouses in one cart, separate orders will be created in the Magento Admin. However, a customer can buy these products within a single order. The next section – Products in Warehouse – allows you to assign products to the warehouse. 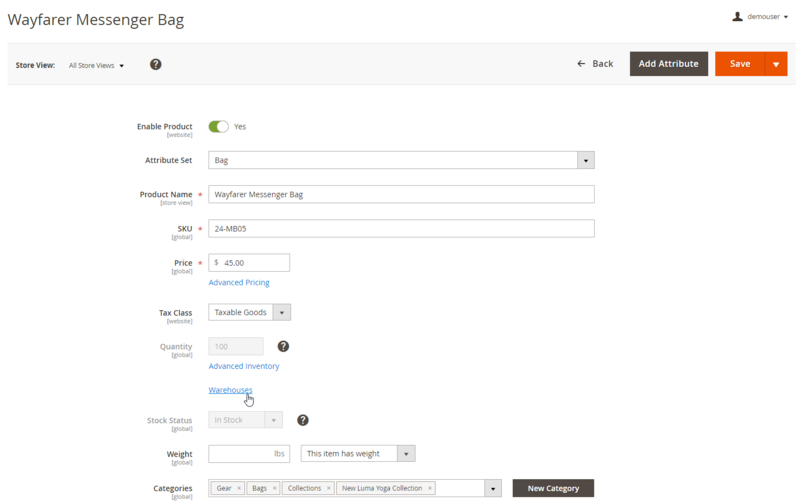 The last section allows setting custom shipping rates for different shipping methods. 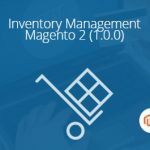 The Manage Stock grid of the Magento 2 multi warehouse inventory extension contains all products. For each product, you can view its ID, name, SKU, and status. Besides, it is possible to edit stock for each warehouse separately right on the grid. Just click on a product row and modify the Qty field. The Magento 2 multiple warehouses module allows assigning an individual product to a warehouse. Select a required item from the Products grid and click the ‘Warehouses’ link. Note that if you don’t see the link on a product page, it might be caused by a simple product without weight. To avoid this issue, check if ‘This item has weight’ option is selected in the “Weight” field. After you click the link, a new screen will open where you can adjust the quantity per each warehouse and enter the Room & Shelf value. If you want to display available product quantity in each warehouse on the storefront, scroll down to the Customizable Options section on a product view page and configure appropriate settings. 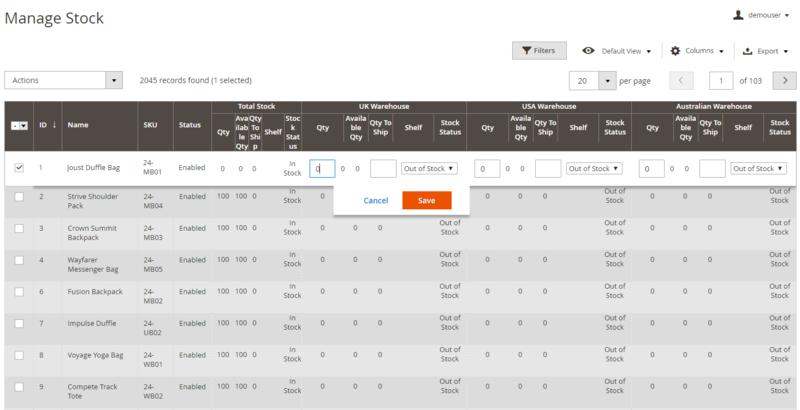 Using Multi Warehouse Inventory for Magento 2, you can update products stock data in one click on the Import Stock page. 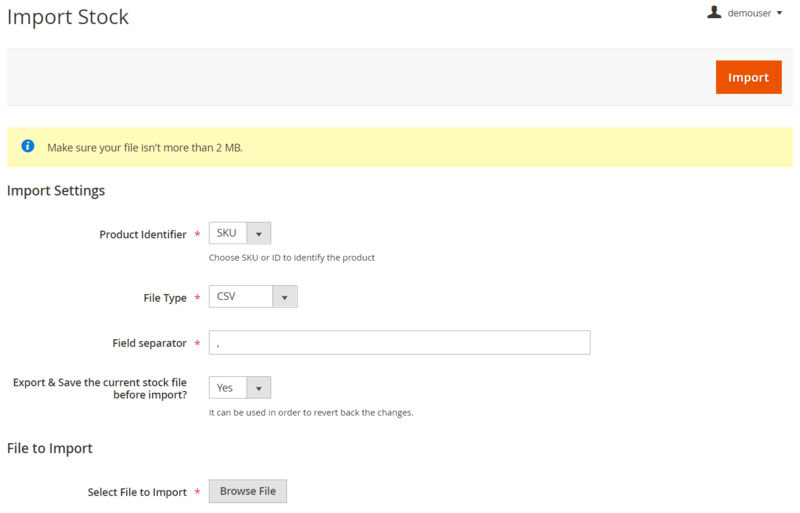 In Import Settings, the Magento 2 multi warehouse inventory module allows you to select a product identifier (SKU or ID), choose a file type (CSV or XML), specify field separator, as well as export the current stock file before import. Note that you can’t use Cron for importing stock data. There is a separate grid that illustrates export history. It shows a file ID, name, and time and date of its creation. It is possible to download or delete each file from the Action column. On the Ordered Products Report screen, select a time interval, and the Magento 2 multi warehouse inventory extension will show you the number of ordered items for each product separately. You can create Low Stock reports for each warehouse of your total stock. The corresponding grid displays a product name, SKU, and stock quantity. The low stock level can be specified in settings. The general settings of this Magento 2 multi warehouse inventory extension are divided into three sections: Stock Settings, General Settings, and Store Locator. 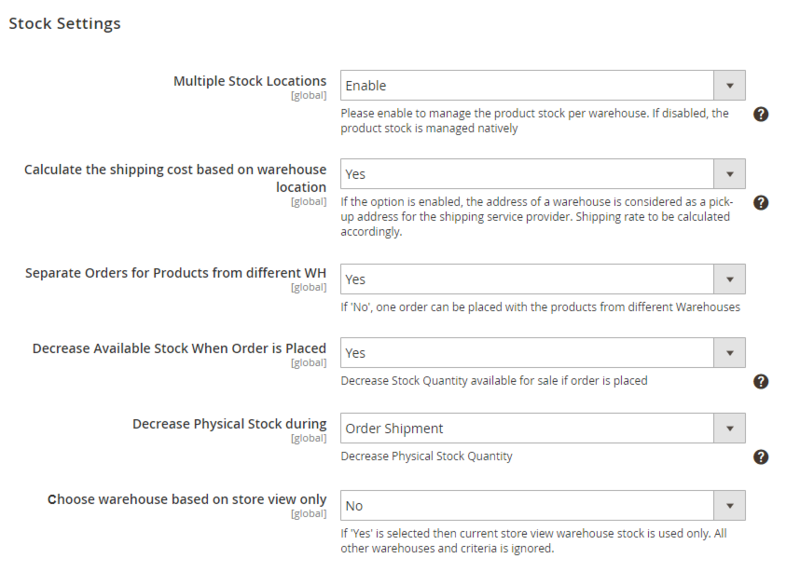 In Stock Settings, you enable/disable the extension, allow calculating shipping cost based on warehouse location, and separating orders if they are located in different warehouses. 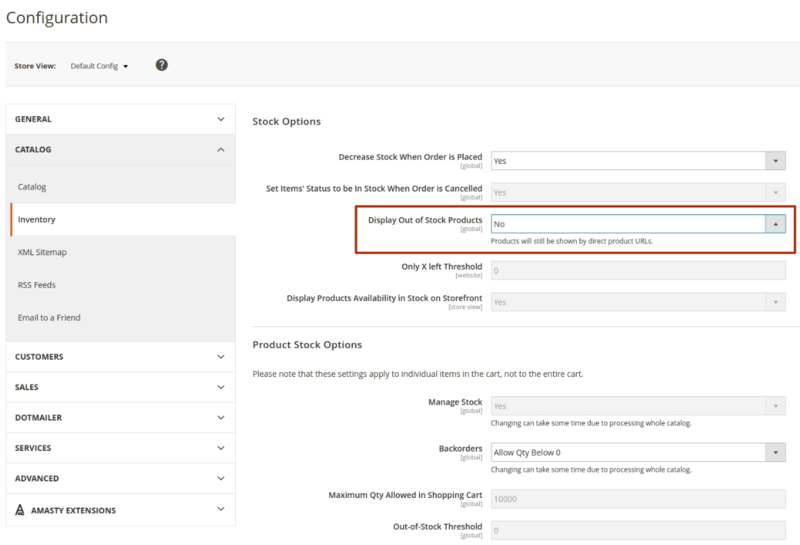 Here, you also decide whether to decrease available stock when an order is placed, choose when to decrease physical stock (order shipment, order creation, invoice creation), and enable/disable using warehouses based on a store view. Then, select a basis to choose a warehouse, enable/disable using Google maps for detecting the nearest warehouse location and ‘Return Credit Memo Item to Stock’ option, as well as specify ‘Low stock Quantity’. 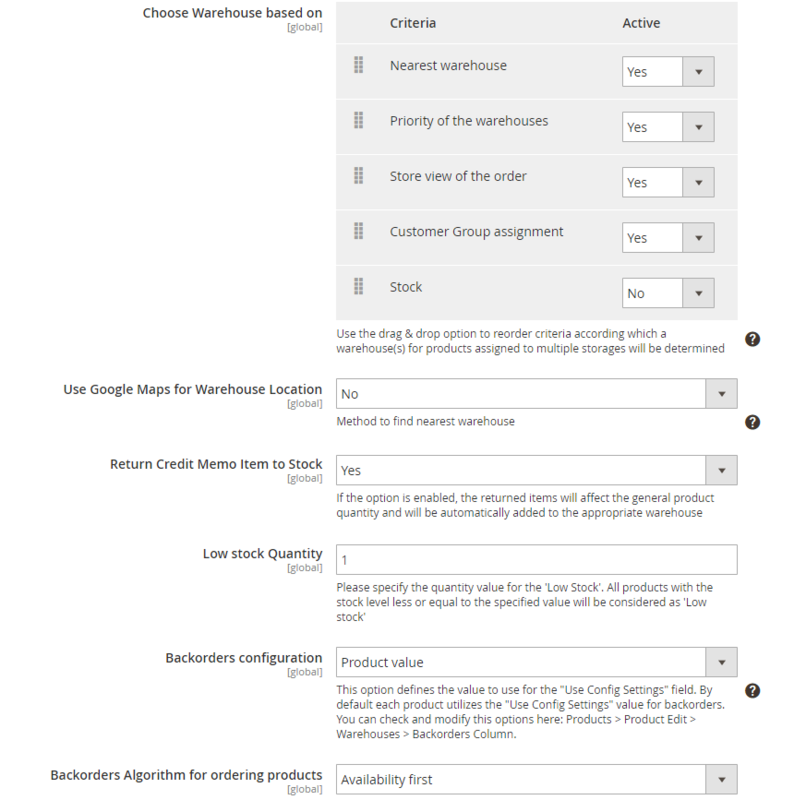 Here, you can also configure backorders (based on product or warehouse value) and choose how the backorders algorithm should work (Availability first or Backorders first). As for General Settings, they allow you to enable log file and Google Address Suggestion, as well as specify Google API. The last section of the extension settings allows configuring Store Locator integration. Note that if you want to use a particular shipping method for a warehouse, you should select a store view and the required option in the Shipping Methods tab under the Sales section of the Configuration screen. This way, a chosen shipping option will be bound to the website where you operate the warehouse. One more important notice regarding store view-specific options is related to the stock availability display on the frontend. By default, an item gets an “Out of Stock” status when its quantity reaches 0. You can configure display settings for each website under the Inventory tab of the Catalog section on the Configuration page. If you want to hide out of stock products on the frontend, choose ‘No’ in the ‘Display Out of Stock Products’ field. Compatibility with Amasty Improved Sorting was introduced. Backorders support was added. 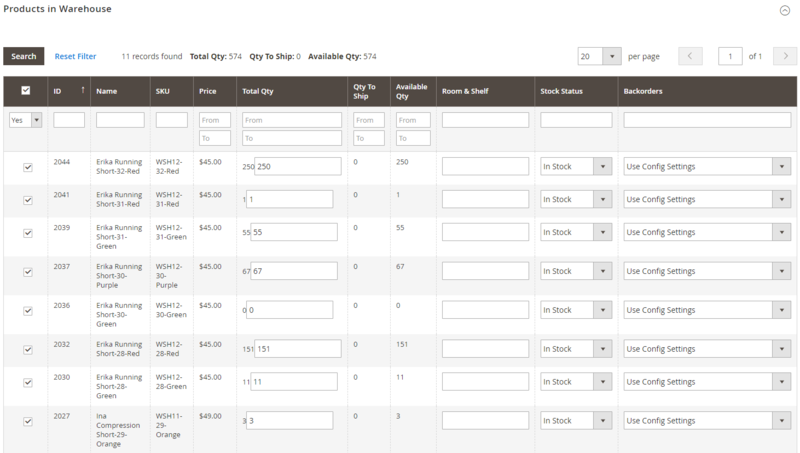 Now you can configure backorders globally or separately for each particular warehouse or product. The ability to configure the order formation mechanism was made. Now an order can be collected from warehouses where the product is available or from warehouses where the product is available as a backorder. New Stock criteria to prioritize shipments from warehouses were introduced. Now you can ship the order from the warehouse where the required quantity of the product is available. Now it is possible to connect stores with certain warehouses. In this case, product-related information changes simultaneously both in a store and in a warehouse. Ability to hide ‘Out of Stock’ products from the listing was added. Compatibility with Magento 2.2 was introduced. Now the “Success” or “Failure” messages are displayed after clicking the import button.